Appreciated by whiskey drinkers since its creation in 1963, Crested Ten is unique as being the first whiskey that the Jameson distillery bottled itself. This innovation heralded the end of Jameson selling whiskey directly to the bonded whiskey trade in Ireland. Hearty pot still flavours are balanced by delicate sherry notes on the taste followed by a warm, lingering finish. Full-bodied with soft, delicate sherry undertones, toasted wood, perfectly balanced with fruit, spices and chocolate. 'A whiskey of great finesse which is balanced beautifully between sweet and dry, light notes and heavy ones. Like all great Irish whiskeys, for the most satisfying results, this should not be sipped but taken by the mouthful and swallowed slowly.' Jim Murray, A Taste of Irish Whiskey. 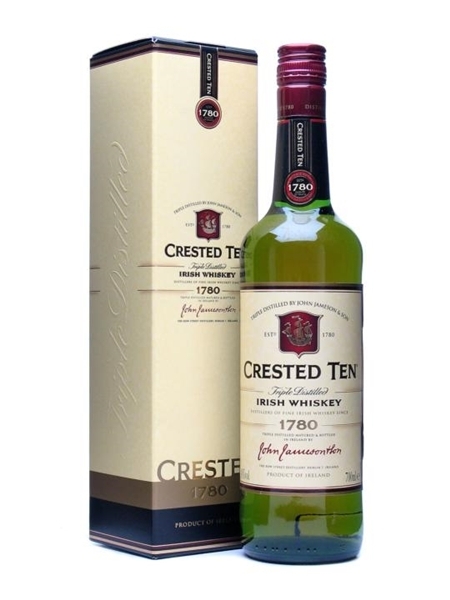 Crested Ten (~€32) is a 7-8 year old blend of about 60% pot still, 40% grain and is bottled at 40% ABV.